The Latrobe Athletic Association football team, 1897. Western Pennsylvania has had a knack for spawning pro quarterbacks. 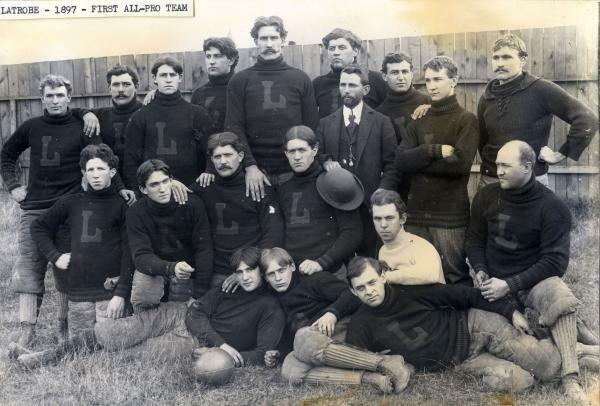 Johnny Unitas, Joe Namath, Dan Marino and Joe Montana all hailed from this part of the state - as did John Brallier, bottom right, with his Latrobe Athletic Association teammates. On Sept. 5, 1895, Brallier, then just 16, became the game's first acknowledged professional, and thus its first professional quarterback, when he accepted $10 plus expenses, then known as "cakes," to lead Latrobe to a 12-0 victory against an eleven from neighboring Jeannette. Though others, including Pudge Heffelfinger, had accepted under-the-table payments before him, Brallier was the first to do so openly.